Packed full of photographs and detailed instructions, this book is a pleasant browse. In fact, it’s down right pretty. My son has spent many a bedtime cooing over the pictures. Make no mistake, though, this isn’t for the novice. I am what could charitably be called incompetent with a tool kit, so as I read through the detailed instructions and material lists I had a sense of encroaching doom. Plus, I never have the competent DIYers stock of scraps of wood, wire or cabinet doors. 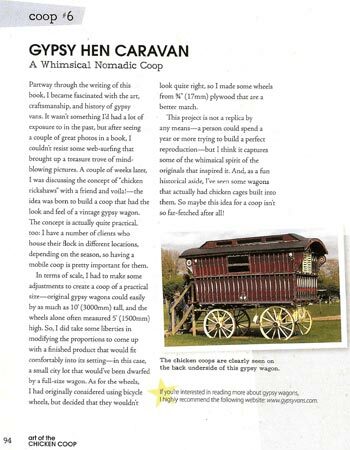 Try as I might, I doubt I’d ever be able to make the gypsy caravan coop. In fact, I know I couldn’t. However, if you do know your way around a tape measure you could make yourself a little masterpiece. Even though I’m useless, however, I suspect that some of these designs would need some slight adaptations for the inclement British weather. Gleason makes his coops in Utah. There are seven coop designs looked at in depth, and then several more design tweaks at the back. Most of the differences are purely aesthetic, but I imagine that most people would be able to find something here that could be adapted to their own set ups.The coops are adaptable to your flock size, which is a nice touch, and we’re introduced to three keepers and their home made housing. Chicken keepers are a nosey lot, by and large, and we do like to see how other people keep their poultry. 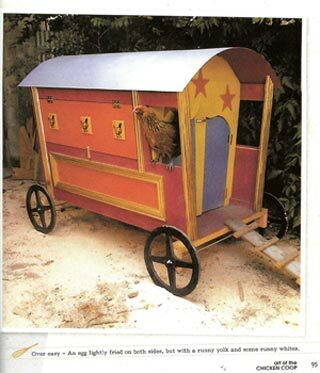 I know a fair few back yard chicken keepers at this stage, but none of them have such wonderfully decorated coops. These are brightly coloured and elaborately decorated and therefore instantly appealing to the pet keeper who just wants a few eggs. They also have the benefit of looking attractive in the garden which is a concern for the average suburban or urban enthusiast. Neighbours are more likely to complain if your garden looks like Steptoes yard. Although I can imagine many a serious poultryman losing his eyebrows in his hairline at the idea of adding wooden stars and individually cut shingles to his poultry shed. But Chris Gleason hasn’t written a book for the serious poultryman. He has written a book for the DIY capable novice. He has included a brief profile of some of the most popular chicken breeds, and some basic care instructions. Touchingly, there are also some basic egg recipes scattered through out the book for when your new flock decides to deliver. The whole thing reads like a gentle coax in to the world of chicken keeping, and an attempt to seduce the would-be carpenter in to using his or her imagination. It’s certainly a breath of fresh air from the ‘just convert a shed’ mantra. My advice? 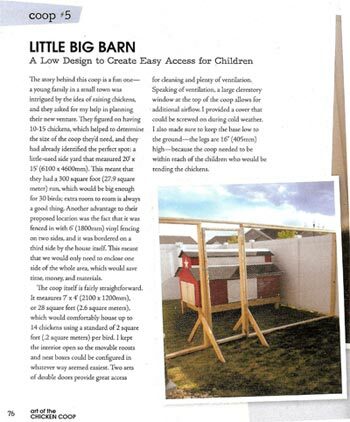 If you’re reading this because you really, really want chickens but your other half is reluctant, BUT likes building things, buy them this book. It might just entice them to flex their creative muscle in order to show off, and while you’re enthusiastically praising their efforts you can sneak a few hens in around the back. It’s a win-win situation.